Cully Fest Base Camp The Festival Home Away From Home! If you’re not an experienced camper or don’t want to go out and buy expensive equipment that you may never use again, well Cully Fest has you covered with Cully Fest Base Camp. The Cully Fest Base Camp package is just one of the amazing ways to stay on sight with pre made tent campsites prepared for your arrival. 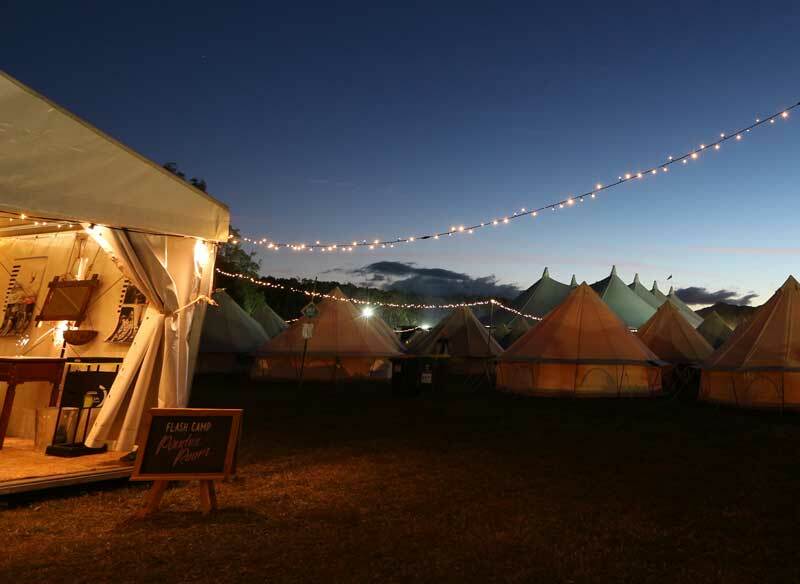 The Cully Fest base camp package offers a comfortable camping experience in the heart of the festival village. The festival village creates an outstanding, friendly group atmosphere thanks to the communal camp kitchen and fire place. Residents will feel at one with nature, situated among pristine gardens and grassy sites with an abundance of fire wood to stoke the group campfire. The village is equipped with amenities and an information desk. The private tent campsites include an air mattress, light and chair, so all you have to bring is your gear, a sleeping bag and a pillow. The Base Camp package is the best of the best, it’s conveniently located and set up, comfortable and close and it’s operated by Peter “Spida” & Sheree Everitt from the Great Australian Doorstep. Both are seasoned campers and travellers exposing great locations around Australia through their TV & Radio travel show The Great Australian Doorstep . No long walks home or expensive taxi rides when you book in at Cully Fest Base Camp. Be sure to book ASAP with limited spaces available. Come get comfy at the 2017 Cully Fest Base Camp. Looking for other options of acccommodation at Cully Fest?